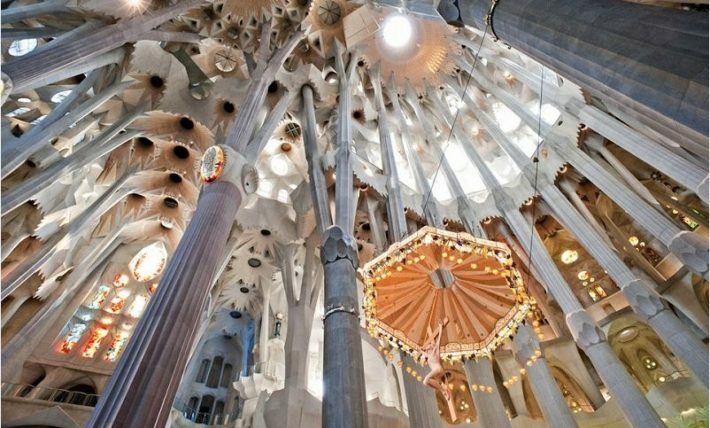 April in Barcelona is full of events for all ages. Except for the Easter and Holy Week, there will be Sant Jordi’s Day, Earth Day and Feria de Abril. Look at our selection of events in and see what is the best one for you. In Spain, the Holy Week is one of the most celebrated Catholic events. Every year, one week before Easter, religious Spanish brotherhoods (cofradía) and fraternities gather in a large procession held on the streets in almost every Spanish city. Most popular are the colorful processions in the south of Spain, but Barcelona also has a large and authentic local procession of men wearing long robes with pointed hoods so do not surprise if you see them or religious figures that are carried on the streets. Once upon a time, a fearsome dragon was destroying a small village in Catalonia called Montblanc. People were frightened and hopeless so they decided to sacrifice one person every day so they could calm the anger of the dragon. The day has come when the king's daughter was supposed to be sacrificed but at the moment she was about to be eaten up by the dragon, a courageous knight, Saint George, killed the evil beast. 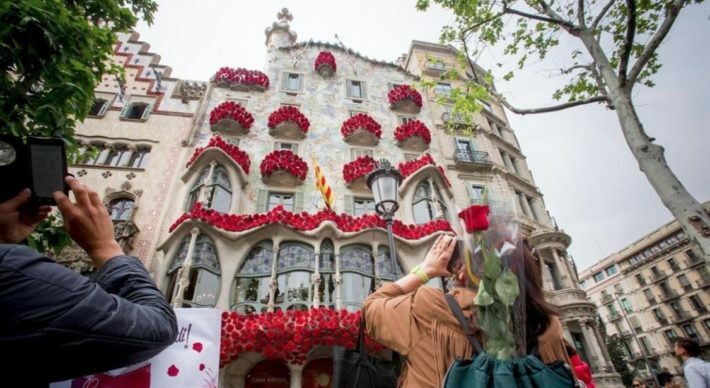 A red rose grew from the dragon's blood and since then, it is a Catalonian tradition to give a rose to your loved ones. 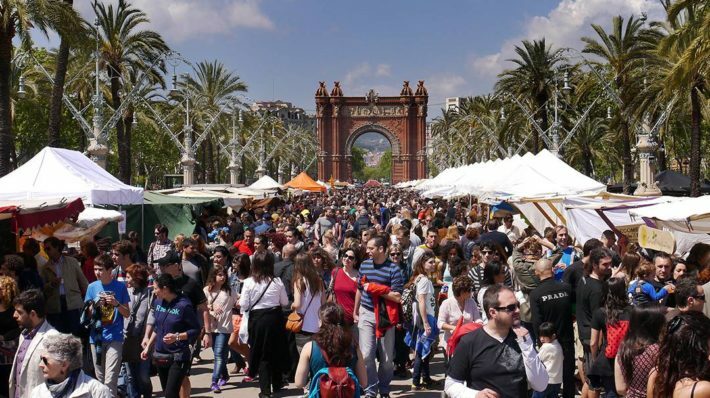 The new tradition is, however, to give a book as a sign of gratitude and that is why Barcelona is full of bookstalls and book markets on Sant Jordi's day. 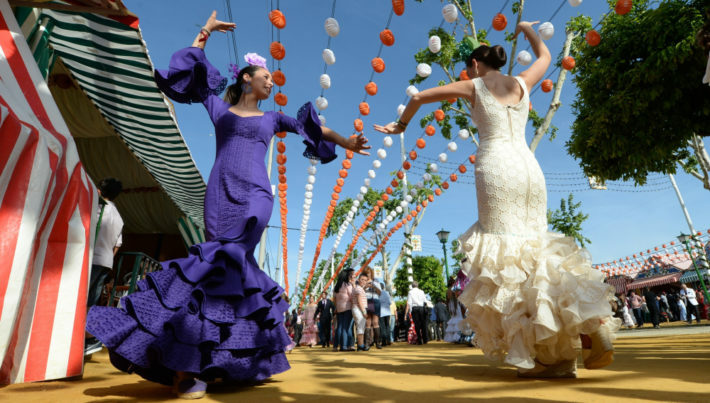 'Fira de Abril de Catalunya' or the Barcelona's April Fair is the traditional festival that has roots in Andalusia. The whole range of colors combined with good music and food are things that make this fun-fair pretty amazing. Fira de la Terra is the Spanish way of celebrating Earth Day while promoting a better understanding of the environment. Earth Market offers outdoor markets, street performances, and activities for all ages aimed to draw attention to the negative impact of modern society on natural and social systems. Temperatures will be between 17ºC and 22ºC (61ºF to 70ºF) so the only thing that you will need to bring in Barcelona is a light jacket and your desire to explore! If you are looking for a perfect apartment where you can stay with your family or friends, go to the Habitat Apartments website and find the one that suits you the best.